Bar scarf with classic Arsenal FC red and white design. Arsenal crest on both sides. 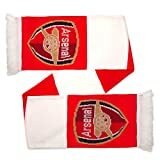 The Arsenal FC Bar Scarf is an official product and is produced under licence for Arsenal FC. Bar scarf with classic Arsenal FC red and white design. Stitched tassels at each end. Arsenal crest on both sides. 100% Acrylic. The Arsenal FC Bar Scarf is an official product and is produced under licence for Arsenal FC. This entry was posted in Soccer and tagged £12.00, Arsenal, Football, Gift, Jacquard, Official, Scarf by FPSports. Bookmark the permalink.